On the surface, running seems like one of the easiest ways to quickly jump into the world of fitness. Compared to most fitness-related activities, it's pretty inexpensive—all you need is a pair of shoes, some shorts, a safe place to run, and you're good to go. Right? Well, ask any of the dozens of beginning runners I've worked with and they'll probably tell you that running is one of the most challenging things they've ever attempted. Why? Well, going from a sedentary lifestyle to suddenly expecting your body to run a mile is pretty unrealistic. Even though it's low cost and can be done most anywhere at most any time, a beginning runner needs to do a little planning to get his/her head in the game before beginning one of the most rewarding and challenging quests. These 10 tips will help you ease into running successfully, and actually enjoy your new life as a runner. The month prior to beginning your new venture into running, go out for a daily walk. Try to walk at least 30 minutes each day. The first week, go for an easy walk. "Easy" is faster than a stroll, but just shy of breaking a sweat. For the next two weeks, up the walk to a moderate intensity. Now you'll be sweating, but should be able to carry on a conversation. For the last week, increase the walk to a hard intensity. During the "hard" walks, you'll be breaking a sweat and, if you're talking, it will be more like a one- or two-word conversation. 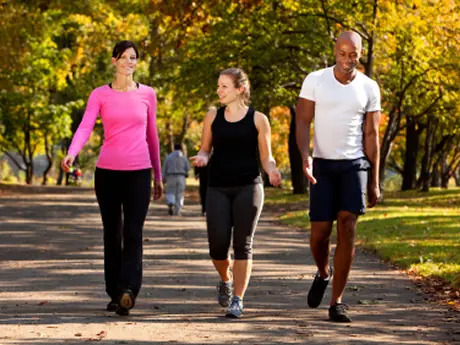 This month of walking will help open up the lungs, get you more in-tune with your breathing, increase your aerobic capacity, and start building some muscular endurance in your legs. It will also help you get into a daily routine of exercise. Running actually requires almost as much upper body strength as it does lower body muscular endurance. During your pre-running walking month, add in a bi-weekly core and upper-body workout. A strong core and upper body will help you maintain good running form, which will help keep fatigue from setting in too quickly when you begin running. No fancy equipment is needed. Some light dumbbells and/or med balls will do the trick. Visit RunnerDude's blog for a great core workout for runners.